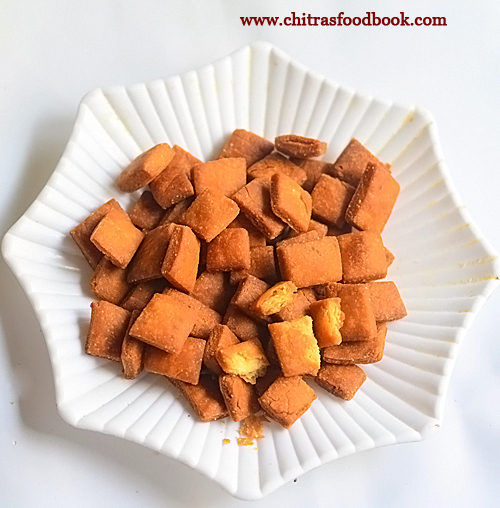 Pottukadalai murukku / roasted gram flour murukku recipe is a simple, easy and instant murukku recipe that is usually prepared for Diwali and Krishna jayanthi /Gokulashtami. It comes out super crispy, crunchy with soft and melt in mouth texture. It can be prepared easily and quickly with store bought rice flour / Idiyappam flour (arisi maavu), roasted gram flour (pottukadalai maavu) and butter/ hot oil. As murukku with roasted gram flour is less flavorful when compared with urad dal ones, we can add ajwain/ Omam, red chilli powder, hing for enhanced flavors and taste. 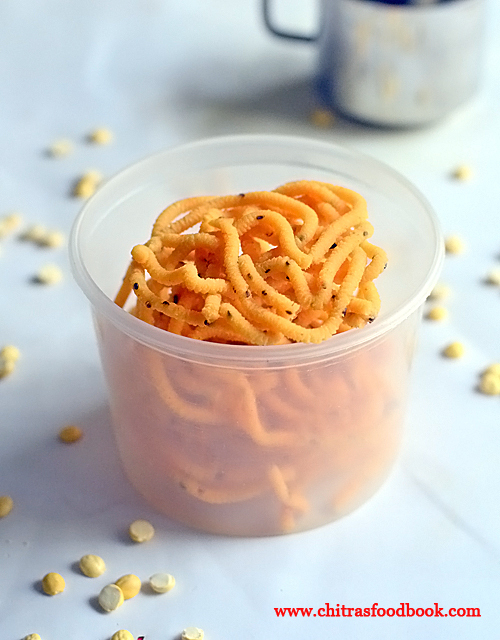 I learnt this simple murukku recipe from my neighbor Divya. Recently I shared a picture of this murukku along with sweet boondi and mysore pak in my Instagram page too. 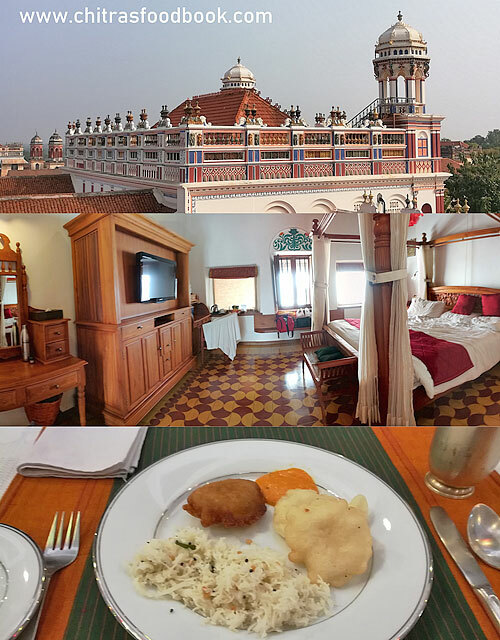 We all loved it especially the smell of ajwain in this murukku. Usually I add cumin seeds /jeeragam or sesame seeds / ellu. I never knew ajwain can be added too. So when my neighbor shared her mom’s recipe, I tried it instantly. It was so good, soft and melted in mouth. Raksha liked this murukku more than my Chettinad thenkuzhal as it was prepared without butter and slightly hard to bite. For variations you can skip red chilli powder to make white colored murukku. Remember pottukadalai murukku absorbs some oil when compared with urad dal murukku. Ok, lets see how to make super easy and quick pottukadalai murukku recipe with step by step pictures. Check out my 15 murukku varieties too ! 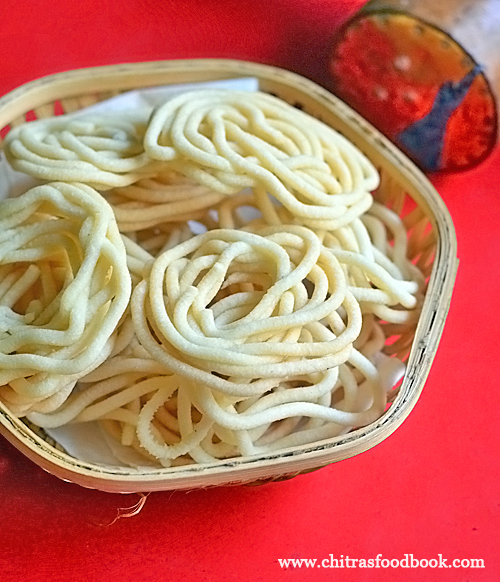 Simple and easy pottukadalai murukku recipe with step by step pictures. 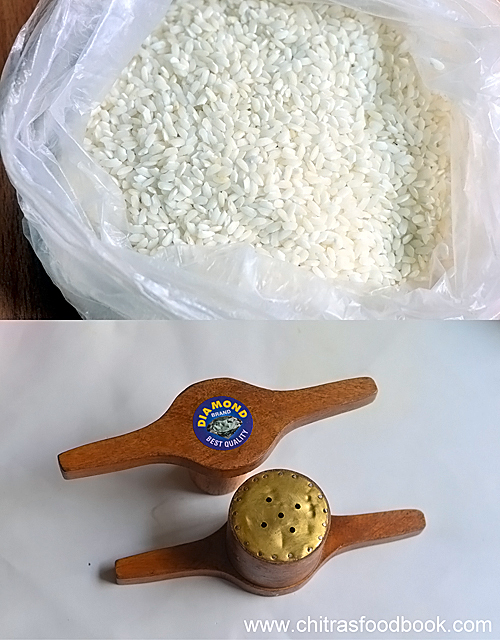 Grind 1/4 cup pottukadalai and measure 1/4 cup powder from it. In a bowl, sieve rice flour, roasted gram flour. Add salt, red chilli powder, ajwain, sesame seeds and melted butter. Mix well to spread butter in the flour. Add required water and make a slightly sticky dough. 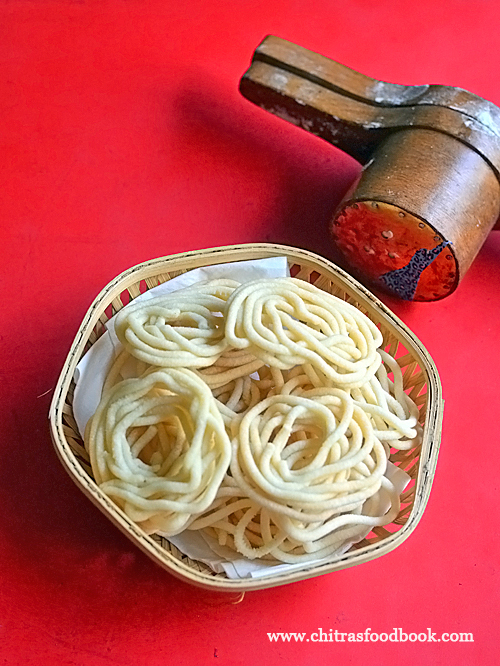 Fill murukku press with dough and squeeze in hot oil. Deep fry both sides till bubbles cease. Remove and drain in a paper towel. Store in a box after cooling down. Stays good for 10 days. 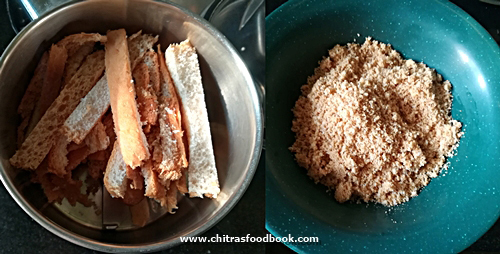 Take 1/4 cup of pottukadalai / roasted gram flour and grind to fine powder. You will get around 1/3 cup of powder after grinding. So measure 1/4 cup of powder from it and set aside. In a wide plate bowl, sieve store bought rice flour, 1/4 cup pottukadalai powder. Add salt, red chilli powder, sesame seeds, ajwain and melted butter. Mix well to spread the butter in the flour. Sprinkle required water and make a smooth, slightly sticky dough. 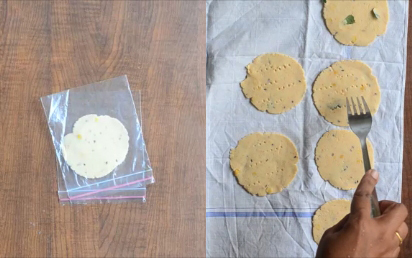 If the dough is dry, murukku gets cut while pressing. So make the dough slightly sticky so that making shapes would be easy. Fill the murukku mould with the dough. Cover the remaining dough with a wet cloth to avoid drying. Take 3 holed or single holed mould. I used murukku mould with 5 holes. Heat oil to deep fry. Check the oil temperature by dropping a pinch of dough. If it rises to the top immediately, heat of the oil is perfect. Now squeeze the murukku in circular motion in the oil directly OR press murukku in a greased ladle or butter paper ( I used oil wrapper). Drop in the hot oil. Do not disturb for a minute. Cook in medium flame. Flip and cook both the sides till bubbles cease. No problem if there are one or two bubbles. Remove and drain in a tissue paper. Store the murukku after it cools down. Keep in an air tight box and enjoy. It stays good for 10 days. For variations, you can use 1.5 tbsp of hot oil instead of butter. Do not increase the quantity of butter. Murukku may disperse in oil. If dough breaks while pressing murukku, add little water to the dough and make it slightly sticky. It will help. 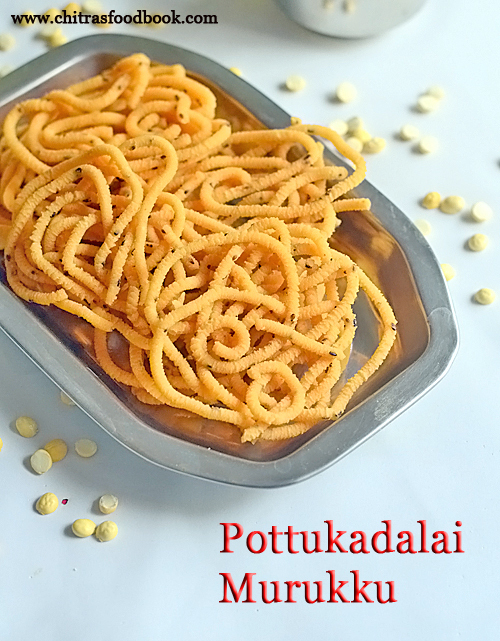 Try this easy, yummy, crunchy pottukadalai murukku for Diwali and enjoy ! 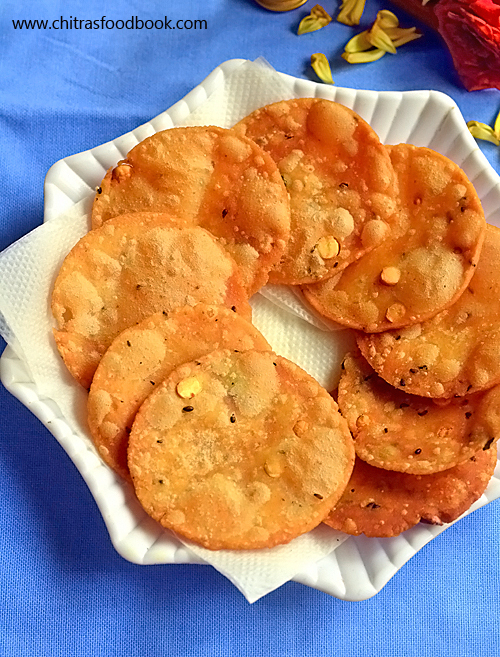 Shakkarpara/ Shankarpali is a most popular North Indian style deep fried snacks recipe prepared during Diwali and Holi festivals. It is popular in Gujarat and Maharashtra. It tastes mildly sweet and is served as a teatime snack. 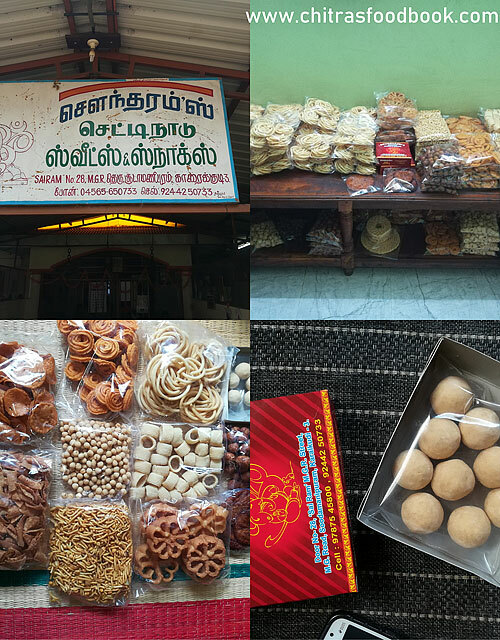 In South India, it is known as sweet maida biscuit. It is usually added in South Indian mixture. I have already shared that recipe HERE. Traditionally shakkarpara is prepared using maida, sugar, ghee and milk or water. 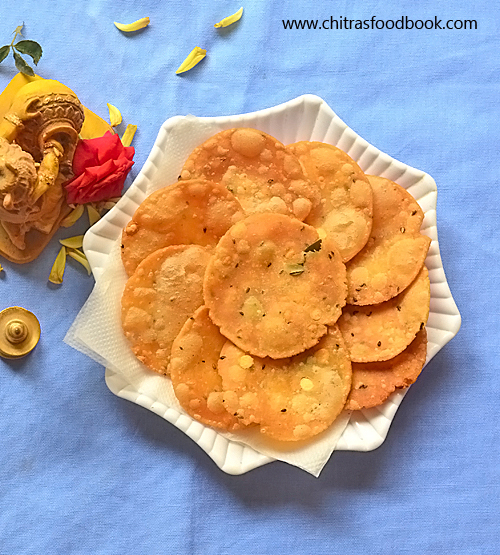 But today I have shared shankarpali recipe using wheat flour/ atta. I watched few YouTube video recipes and came up with this version. As I wished, it came out really well. It was super crunchy and mildly sweet in taste. Sendhil and Raksha loved it very much. They started munching even before it cooled down completely. I was very happy that my first recipe for Diwali 2018 was a big hit with my family. There was no big difference in the ingredients and taste of maida Shakkarpara and wheat flour Shakkarpara. Only thing is the color of wheat flour shankarpali is darker than maida ones. 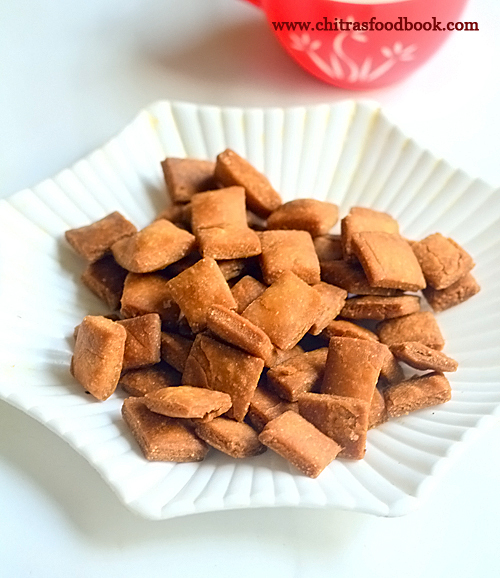 People who are looking for snacks and sweets using wheat flour must give this a try. You will love it for sure. 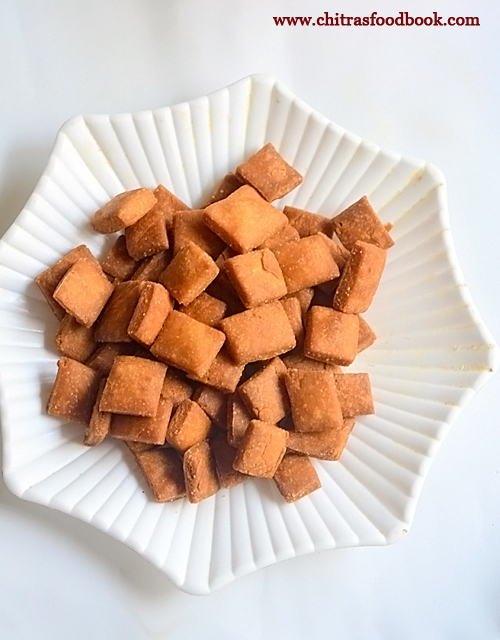 For healthier options, you can also use jaggery instead of sugar and bake them instead of frying in oil. Ok, lets see how to make Shakkar para with wheat flour. Check out my sweet maida biscuits and spicy diamond cuts too. To make Shakkarpara, heat sugar and water in a kadai. After the sugar is melted, switch off the flame. Add ghee, cardamom powder and set aside to cool. Add wheat flour, sooji, a pinch of salt and make a non-sticky dough. 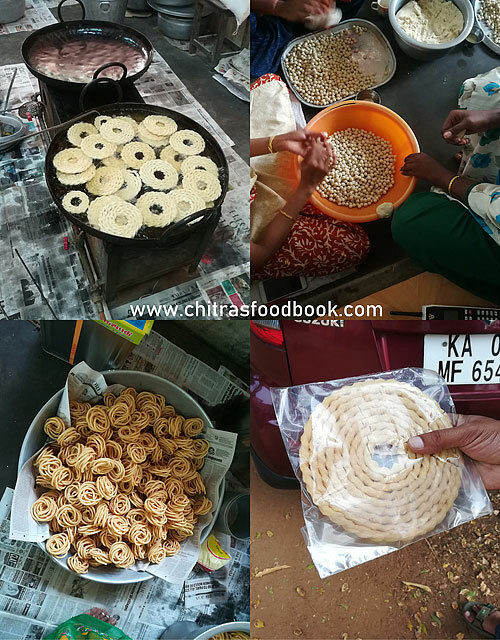 Roll to a thick chapathi and cut into squares. Heat oil to deep fry. Drop a batch of Shakkarpara and deep fry till golden in medium flame. After the bubbles cease, remove the Shakkarpara and cool down to become crunchy. Store in a box and enjoy for a week. In a kadai, take sugar and add water, ghee. Heat and melt the sugar. No need to bring any consistency. Switch off the flame. Add cardamom powder. Mix well. Let the sugar water cool down completely. Add wheat flour, semolina / sooji, a pinch of salt and mix well. Knead to a smooth, non sticky dough. Roll into thick 1 inch chapathi and trim the cracked edges. Cut into small squares using a knife or a pizza cutter. Finish the entire dough by making shapes. Collect them in a bowl. Heat oil to deep fry. Drop a pinch of dough. If it rises to the top immediately, oil temperature is correct. Fry the Shakkarpara in batches in low to medium flame till bubbles cease completely. As soon as you put the shakkarpara in oil, do not disturb it for a minute. It will break it you touch it now. Let it cook in low flame. Then flip and toss it gently. Toss it whenever needed for uniform color. Color of wheat flour shankarpali would be darker than maida ones. So do not panic. Try to cook in low flame patiently by tossing it regularly. It helps to get nice golden color as shown in the pictures. But remember to remove them only after the bubbles cease. Remove them in a tissue paper. It tastes soft when hot. But it becomes crunchy once it cools down completely. Deep fry all the Shakkarpara in batches. Cool down and store in a box. It stays good for one week to 10 days. Enjoy ! You can add sugar and water up to 1/3 cup based on the quality of wheat flour because some flour takes more water while kneading the dough. Deep fry shakkarpara only in low to medium flame else the outer layer darkens soon without cooking inside. So the next day it will become soggy and soft. Similarly deep fry all the batches properly. Even if one batch is not fried well, it will spoil the entire sweet. So please fry them patiently. Try this yummy shakkarpara with wheat flour, you will love it ! 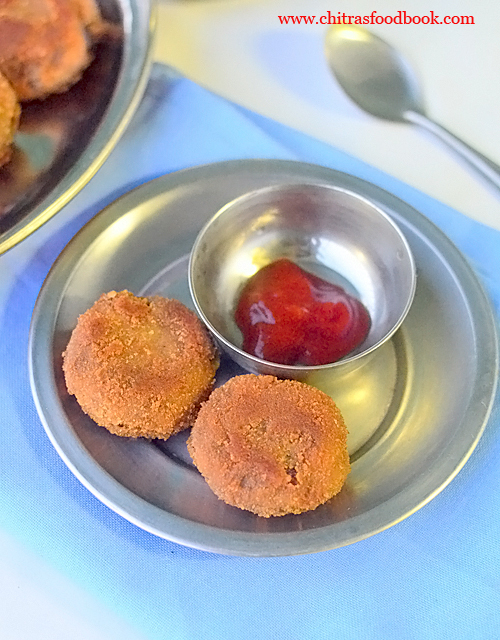 Thattai @ thattu vadai @ thattai murukku @ elladai @ nippattu @ chekkalu ( ppaahh, so many names 😃) is one of my most favorite South Indian snacks recipe. Usually thattai is prepared with rice flour, urad dal flour, butter or oil. But nowadays in many snack shops, thattu vadai is prepared using maida/ all purpose flour, pottukadalai maavu (fried gram dal flour), vanaspathi and cooking soda to make it white, crispy and melt in mouth. But I followed a traditional Tamil style thattai recipe from one of my old cookbooks. It comes out golden brown in color and tastes crispy, slightly hard just like the way it should be. Traditionally thattu vadai is prepared using homemade processed rice flour but today I have shared the same recipe using store bought idiyappam flour to ease the job. In my family, we don’t have the practice of making thattai for Krishna jayanthi. But many people make elladai / thattai for this festival. 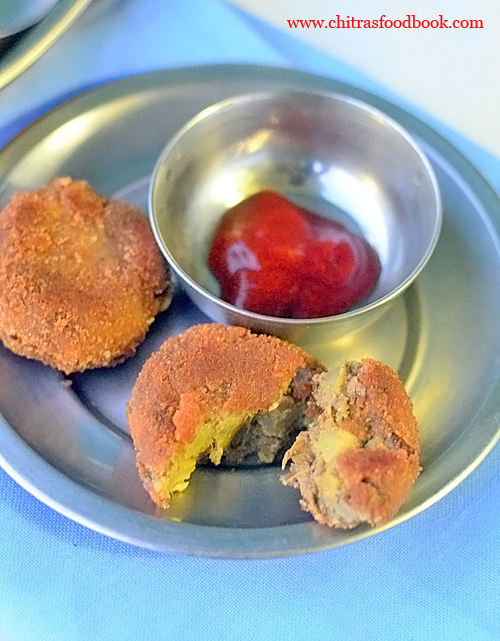 So I thought of sharing this easy, crispy thattu vadai recipe with you all as my Gokulashtami special recipe. 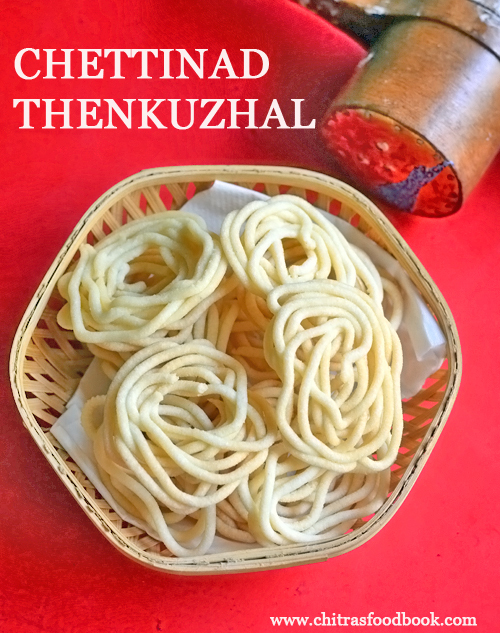 Lets see how to make Tamilnadu style thattai recipe with step by step pictures. 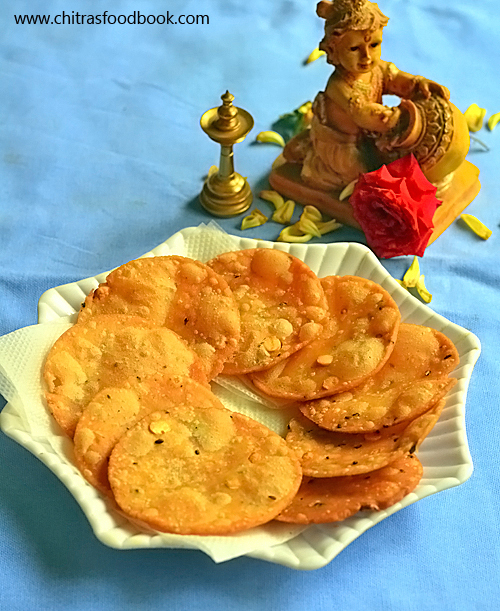 Check out my other Gokulashtami recipes in THIS LINK. In a wide bowl, mix all the ingredients, butter. Mix well. Add water gradually and make a smooth dough. Take a big gooseberry sized ball. Pat in a greased zip lock cover. Prick with a toothpick. Arrange the thattai in a cloth and rest for 10 minutes. Deep fry both sides till bubbles cease. Remove and drain in a tissue paper. Store in a box after it cools down. Stays crispy for one to 2 weeks. Wash and soak 1 tbsp chana dal in required water for an hour. In a wide bowl, take the rice flour, roasted urad dal flour, salt, sesame seeds, hing, chopped curry leaves, soaked & drained chana dal or fried gram dal. Add melted butter and mix well. Make sure butter is mixed well with the flour. Add water gradually and make a smooth, non- sticky dough. Make big gooseberry sized balls and keep it covered with a wet cloth till use. Take 2 zip lock covers or any thick sheets. Grease with oil and place a dough ball over one sheet. Cover with another sheet. Take a small bowl and press the dough to make a flat and thin circle. To make crispy thattai, pat it thin. You can cut the thattai into perfect round shapes with the bowl if you like. Shape all the balls into thin circles. Carefully remove the thattai. If the thattai breaks while patting or removing it, dough is dry. So sprinkle little water to the dough and then make shapes. Remove the thattai from Zip lock cover and arrange them in a cotton cloth to absorb extra moisture. Let it rest for 10 minutes. Heat oil to deep fry. Drop a pinch of dough into hot oil. If it rises to the top immediately, oil temperature is right. Now keep the flame medium and drop the thattai. Cook both the sides till bubbles cease and becomes golden brown. Drain in a tissue and store in an air tight box after it cools down.Stays good for 2 weeks ! Prick the thattai with a fork without fail. It prevents the thattai from puffing up. Oil temperature should be perfect. 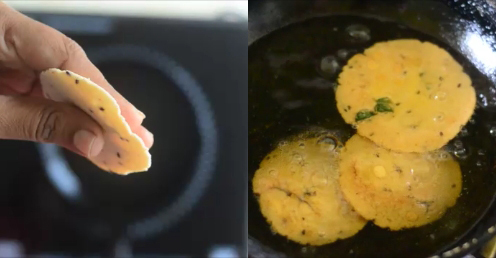 If the oil is too hot, thattai becomes golden brown without cooking properly. Cook slowly in medium flame. Remove the thattai only after the bubbles cease completely else it will become chewy. Pat it thin and even else it won’t cook perfect. 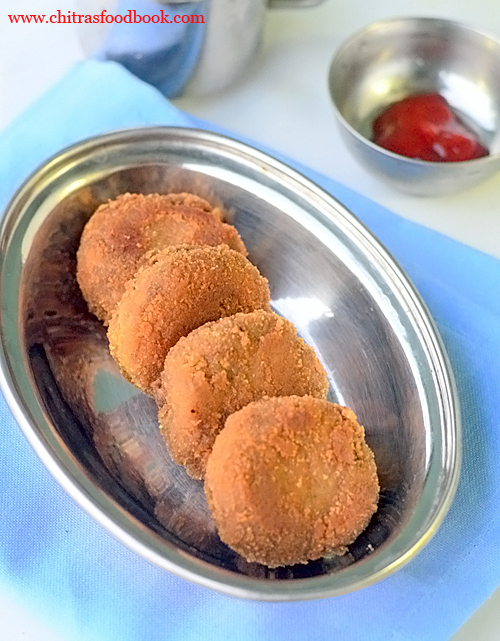 To make crispy thattu vadai, pat it thin. 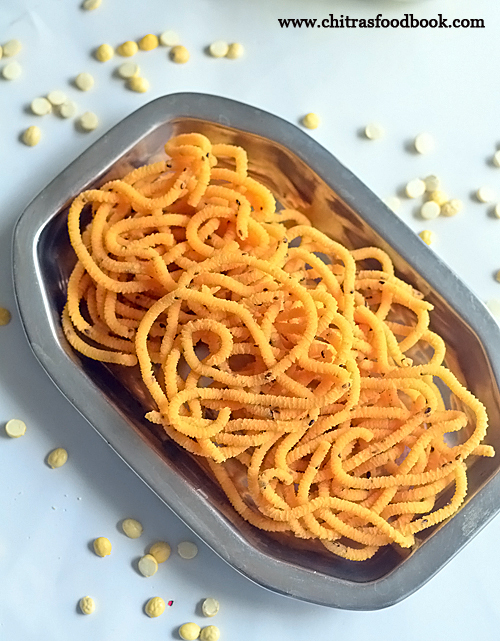 Try this crunchy thattai murukku and enjoy !